The Tapioca icing is amazing and so much less clumpy than the yogurt! It dries harder and faster too! Thank you! 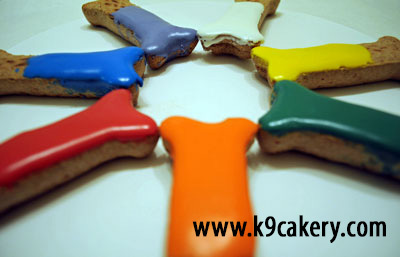 Icing works great for decorating our specialty dog bones. Easy to color, dries hard and doesn't crack. Absolutely love this icing! It is perfect for our pet bakery. Our customers absolutely love it. Very easy to work with, and I have had great success using a water based gel food color to obtain a more vibrant color than the powder provides. We will be purchasing for many years to come! I absolutely love this icing mix. I like that I can play with the consistency depending on how detailed I am decorating by adding a little more or a little less water. I have been buying this product for the past 3 years and my decorated dog treats would not be the same without it. It dries solid without being sticky and really takes on the look of a royal icing that we as people enjoy. Have used this icing for many years and I am very, very pleased. I always get a perfectly iced treat when I use the icing. Q: How long does it take for the icing to become hard? It has been 24 hours and it is still tacky. I used liquid coloring. A: Icing will dry in 12 - 24 hours or less in most cases. It must be left in open air to dry. Do not cover the icing, place it in a package, or put in the refrigerator until completely dry. We also suggest that you use only powdered food coloring since it gives the best color and because liquid colors, especially gel coloring, can make it remain tacky. Gel colors are glycerin based and glycerin does not dry, thus interfering with the icing drying. Q: I need to cook a cake or cookie, and I need to on top add the yogurt. Would like you advise which one is OK? thank you. A: All of our products are designed specifically for pets. In general, people choose the icing for treats and the frosting for cakes. The icing is designed to flow and run and the frosting is designed to be a bit stiffer. Q: Once mixed with water, does the mixture need to be refrigerated? How long will the mixture remain stable? A: Once the product is mixed with water, it should be applied to your treat or cake and left in open air to dry fully. Do not refrigerate until the product is fully dry. 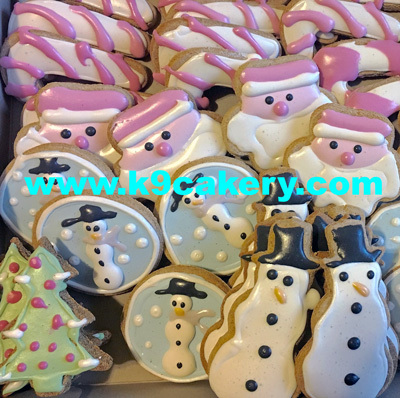 If you have excess icing that you did not use, put it in an air tight zip top bag, remove all of the air and refrigerate it. It will last a few days giving you time to use it. Since it contains no preservatives, it will eventually get moldy if it is not used and allowed to dry in open air. We recommend mixing only as much as you plan to use at one time.